Italian parsley has dark flat leaves and slender stems, with a bright and slightly bitter flavor. The stems have more flavor and aroma than the leaves. Italian parsley is sometimes mistaken for cilantro, and they do look similar. Italian parsley tends to have darker, shinier leaves than cilantro (which also known as coriander), and cilantro leaves are more delicate and fragrant. 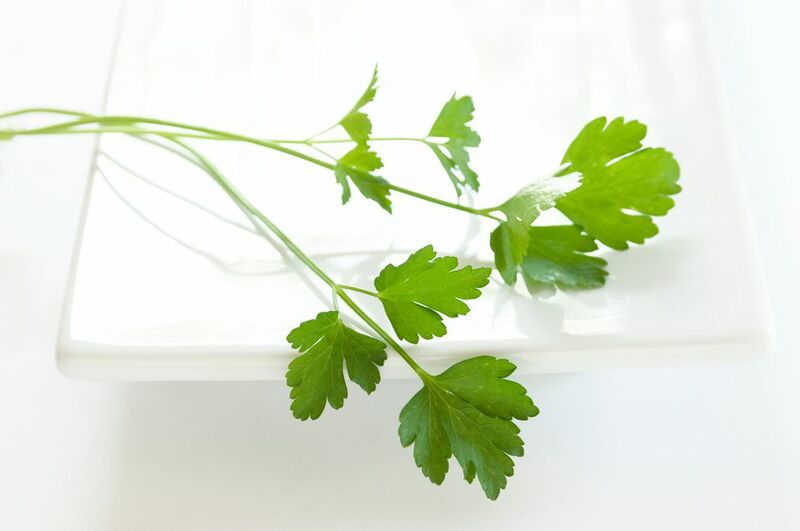 The parsley leaves are commonly used as a garnish or flavoring herb at the end of cooking. Parsley stems are one of the traditional ingredients in the bouquet garni and sachet d'epices, which are used for flavoring stocks, soups and sauces. Parsley has a ton of uses, and it usually comes in rather large bundles at the store. There are certain recipes that will call for using an entire bundle at one time like such as gremolata or pesto. Other recipes may simply add Italian parsley as the final step of cooking, for a garnish and fresh seasoning, like a chicken piccata with lemons and parsley recipe. To keep your Italian parsley fresh for as long as possible, it's best to clean the entire bunch with water, gently wrap it in paper towels, place it in a ziptop bag, and store in the refrigerator. Stored like this, the parsley should stay fresh for a week. Even if you're not much of a gardener, herbs are great to grow because they don't need much space—you can grow them in containers—and once they get going, you can snip off the amount you need for whatever dish you're preparing at the moment. Parsley is a biennial plant, which means that it grows for two years—in the second year of growth, it flowers produces seeds and then dies. The leaves are still edible into the early part of the second spring, but as soon as the flower shoots appear, the leaves will be bitter, so you can pull out the plant at that point. You can grow parsley from seeds or from starter plants, and the latter is your best bet if you're a beginner. Parsley does well in full and partial sun, and the flat-leaf variety does quite well in hot summers. One other benefit of planting parsley in your garden is that it's a favorite food of the striped caterpillar (called a parsleyworm) that becomes the black swallowtail butterfly. Simply by growing parsley, you'll be feeding butterflies as well. Just be sure to plant enough parsley to share with the caterpillars.